The Holy Roman Church ruled the Holy Roman Empire through a feudal system of kings, queens, lords, landowners, and bishops. It stretched across several continents and rivaled other empires for thousands of years in economic and military prowess. Rome was its capital; the Vatican, the seat of its state religion and papacy. In AD 1054 the empire divided between East and West; its Eastern counterpart, the Byzantine Empire, ruled alongside the Eastern Orthodox Church, in Constantinople. The Roman Catholic Church/Empire waged war against numerous countries for thousands of years. Its popes initiated seven out of the nine Crusades, one of which was solely against the Byzantine Empire, which subsequently hastened its catastrophic end in AD 1453. The Roman Catholic Church imposed taxes on everyone except its clergy. Its bishops ruled with an iron scepter, collecting taxes, and torturing and imprisoning those who couldn't pay. The church regulated nearly all areas of life, including literacy. Its edicts were in Latin; no bibles existed in anyone's native language. Unbeknownst to even himself, a young German Augustinian monk, Martin Luther, completely upended this system. Luther initially sought to clarify church doctrine and reform it from within. Despite attempts on his life and retaliation and persecution, his persistence led to one of the most significant events in history that quite literally changed political and religious institutions forever. Reeling from watching starving peasants buy indulgences for their salvation from his wealthy colleagues, Martin Luther delved deeper into the New Testament book of Romans. Un-coincidentally, the Apostle Paul wrote to Christians living under the same empire as Luther roughly 1,500 years before. His discovery led to repeated questioning and challenges about the political and religious system imposed by the church, an agonizing realization that he could no longer dedicate his life to what he had previously, and a new found faith in salvation through Christ alone. 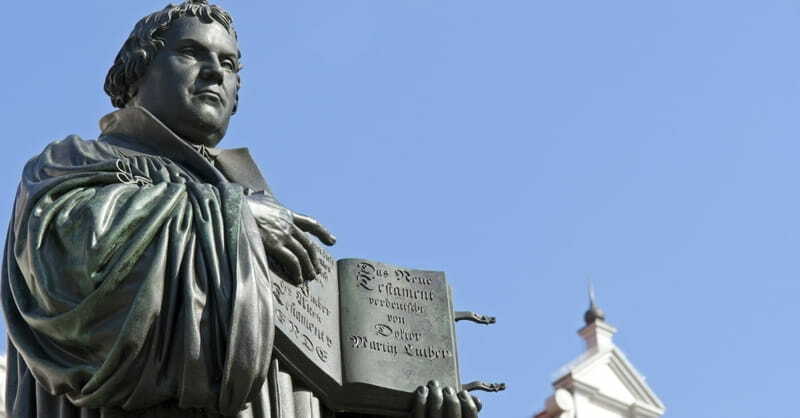 On October 31, 1517, Luther posted Ninety-Five Theses to the front door of the Castle Church in Wittenberg, which listed 95 issues he could not reconcile between Roman Catholic doctrine and the Bible. This was a political act as much as it was theological, and it nearly cost him his life. Eventually, Luther stood trial at the Diet of Worms, where he was forced to recant or be excommunicated; which he could not do, and was. Fearing for his life, Frederick the Wise requested that Luther be taken under his protection at Wartburg Castle. Luther hid there for nearly one year under a false name (Junker Jorg, "the Knight George") and translated the New Testament into German in just a few months. The first "Lutheran" New Testament was published in 1522. The complete Bible, containing the Old and New Testaments and Apocrypha, was published in 1534. His motivation was spiritual, but the outcome was political-- which reverberated worldwide. Because of the gospel message-- that every person has value and worth because they are created by God-- peasants demanded their freedom. A light pierced through the Dark Ages; those who had been trapped in poverty and despair began to question the status quo and learned to read in their own language. If they were equal under God, why were some being oppressed by others in the name of God? Protest, however, was costly. Revolting against an oppressive feudal system led to mass starvation and economic losses, civil wars and schisms, and persecution and martyrdom. Freedom inspired a thirst for knowledge and the opportunity to improve the lives of generations-- but it was not free from a painful transition period. New believers called themselves Protestants, marked by their protest of and separation from the Roman Catholic Church and empire. Luther's protest and what became known as the Protestant Reformation, sparked reformation movements throughout the continent. His courage continues to inspire Protestants 500 years later worldwide.